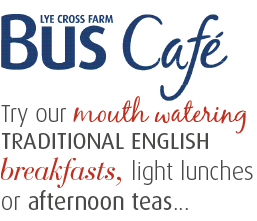 Lye Cross Farm Bus Café uses delicious local produce to make fresh, high-quality breakfasts, lunches and light snacks. We use local Martin Carwardine tea and coffee, and are open 6 days a week. Pop on and see for yourselves, Dan will be pleased to see you!